Cast Charm Face Set~ Pkg of 2, 1 larger & 1 smaller face. Made from fine pewter & brass. The larger face measures Approx, 5/8" at its widest and the smaller face, 3/8". Unique in its style, it also comes with a shank on the back similar to a button. To use flat, simply use your button shank nippers to easily remove. Using the larger pewter finish charm above, I cut the shank and glued it to cardstock and then beaded around it randomly. The scan does not capture the true color of this piece. I finished it with the pin/pendant bail. Cast Sun Face with Stars~ Pkg of 2, measures almost 3/4" at it widest each direction. If you want to use flat, no problem, enough area on back to glue flat & smooth. 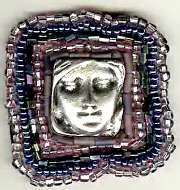 Cast Double Sided Face Bead~ Pkg of 2, measures approx. 3/8" at its widest. It is approx 1/8" thick. Great to use as a mold. Has a vertical bead hole. Made with Love~ This silver tone cast charm bears the same sentiment on each side and the heart depicted is deeply embossed in the metal. Measures approx. 1/2" in length. Affordable enough to add to all your projects or special gifts. Pkg. of 8. Elegant Lady Charm~As you can see, there is a lot of great detail in this brass charm. Top to bottom she measures 1 1/2" and at the widest point across the shoulders she measures approx. almost 7/8". PARIS Word Charm~ Bright brass charm that measures approx. 5/8" wide and approx. 1/4" high without the loop. With the loop it measures 3/8" high at that point. Pkg. of 12 charms. For a loopleass charm, just snip the loop off with our Button Shank Nippers. Eiffel Tower Brass Charm~ Wonderful detail in this little charm. It measures approx 7/8" high including the offset loop at top. At its widest point it measures 3/8" wide. Pkg. of 12. For a loopless charm, just snip it off with our Button Shank Nippers. 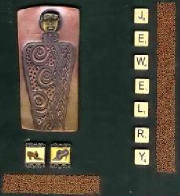 Cigar box has cast face bead embedded into polymer clay stamped with UM RS goddess.